For the long Thanksgiving weekend, we decided to head out of town and get a change of scenery. For those who don't know, we also managed to adopt a dog in September and we decided to bring her along for our trip. We learned that she gets car sick. Thankfully we'd put a blanket down in the car, but it didn't catch quite everything. It was awesome. Her name was in limbo for months. It wasn't until the girls came home for the holidays that we all kinda sorta agreed that Mokka would be our choice. We have a general policy that our pet names are food-related to the country we adopt/rescue - ergo, Tandoori from India, Falafel and Shawarma from Jordan. We tried out all sorts of things, but German does not make nice sounding words in general. The best I could come up with was Seehunde, which is definitely not a food. Nothing rolled off the tongue. But now we have our German Mokka. We actually got her from FAPF, a rescue in Hungary (and attempted to come up with a Hungarian name when German wasn't being fruitful). Why, you may ask? Many rescues/shelters in Germany won't adopt out to Americans. Take a guess why.... oh I'll tell you... because so many of the animals in the shelters come from Americans. They are a little burned by us. 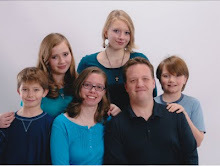 So we adopted from Hungary via photos, a questionnaire, and a hope that it would be a good match. She came to us scared of pretty much everything. And not house-trained. Well, maybe she was house-trained with an accessible yard, but not so much to a 3rd floor apartment. I had my moments of questioning why we adopted a dog. Yet here we are 3 1/2 months later and the dog that was scared of going outside, roads, parks, other dogs, noise, pretty much everything, is slowly gaining her confidence. Though we were told she's over a year old, she still behaves like a puppy, which I guess she kind of still is. She adores the cats and would love if just one would be her friend, but so far no luck. Tandoori just stares her down until she warrants a hiss and swipe. Shawarma meows his warnings when she gets too close. Falafel tries to ignore her. She's settling in. The girls were thrilled to meet her when they were home for the holidays. I guess we'll keep her. 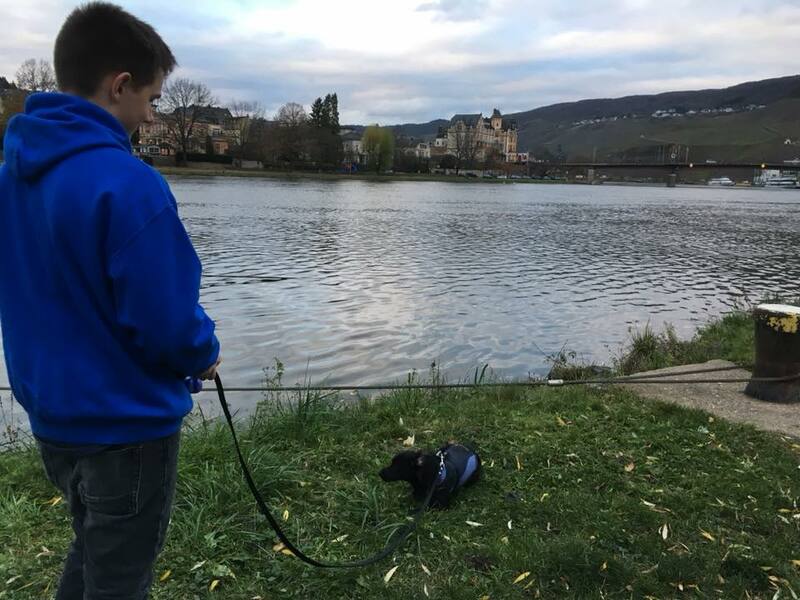 So back to my story, we took her to Biersdorf am See for the weekend. She threw up in the car multiple times there and back. So our first night we left her at the little cottage when we went to get dinner in downtown Bitburg (home of Bitburger beer) at LouM Steakhouse. A fabulous steak that comes with a "salad bar" salad. Pass on the salad bar salad unless you're a huge fan of various shredded cabbages and carrots in various mayonnaise and vinegar solutions. The dog thought we'd abandoned her forever. A horrible ride in a horrible car to a new place she'd never seen, and then left behind for 2 hours... absolutely abandoned. And then we came back! And all was well! in New York with her best friend. Biersdorf am See is not much bigger than a hamlet on a little lake. There are hiking trails all over, but it was November which means it rained most of the time so the dog was walked but the hiking trails stayed a mystery. Friday we spent in Luxembourg at the Christmas markets. And we brought the dog. It was only an hour away, and yes, the dog threw up. Again. The Luxembourg markets are not worth traveling all the way to Luxembourg for. Sounds harsh, but there's no charm to them, and little more than liquor and some food. Seriously disappointing. The Feuerzangenbowle was pretty awesome though. We went "home" to our cottage, got take-out from the nearby pizza place, and built a fire. The hosts of our holiday rental were great, leaving wine, fruit, milk and eggs, candy for the boys, and dog treats for the dog, along with firewood for the fireplace. How many people does it take to start a fire? All of them, and lots of trial and error when there is not real kindling. Here's a tip you don't want to try at home but finally worked and got some steady flame.. rub kitchen cooking oil on a small log, wrap in paper towel, and light. Saturday we tossed up the idea of taking the dog to Trier vs leaving the dog at the cottage and dealing with less vomit. We left her behind, which worked out best for everyone as it allowed us (ok, me) to enjoy the Library Treasury and then take on an Escape Room. Of course it was raining. The dog thought we'd really really abandoned her for real this time oh my gosh we were never coming back and then we did and why did we leave her and she really needed to pee. Taking the lessons from the night before, we made an awesome fire that roasted the entire room and it was glorious. I thought when we moved to Frankfurt that we'd have a fireplace in our apartment and we don't and it was kind of sad. So we all just stared at this one and burned our retinas for a while. The next morning our plan was to head to Bitburg to visit the Bitburger brewery and get home after lunch. A text from Becca said "Landed!" to which I replied "Where are you?" and she said "Frankfurt" and I cursed badly in our cottage in Biersdorf am See 2 1/2 hours away and Katherine laughed and laughed and laughed through her messages from Virginia. Family chat groups are awesome. And when you ask your spouse what time your child is arriving be sure to clarify that the date matters too. Choosing between her options she waited at the airport for us to arrive with barfy dog in tow. She's a great sport. But we did miss the Bitburger brewery. eToro is the ultimate forex broker for newbie and full-time traders.